Then he left the crowds and went into the house. 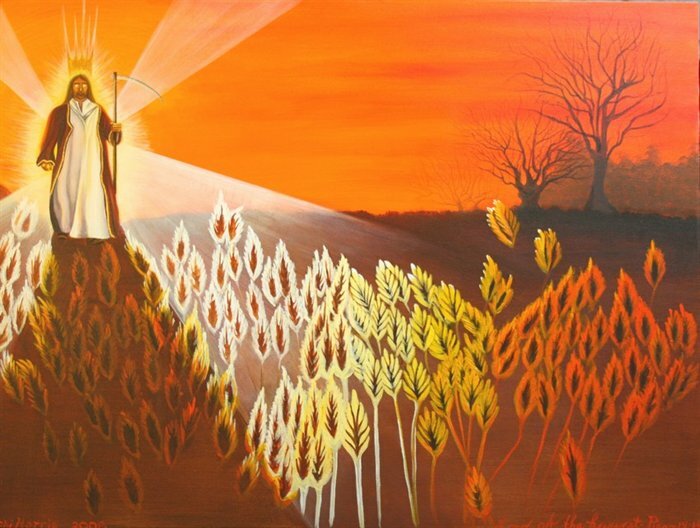 And his disciples came to him, saying,“Explain to us the parable of the weeds of the field.” He answered, “The one who sows the good seed is the Son of Man. The field is the world, and the good seed is the sons of the kingdom. The weeds are the sons of the evil one, and the enemy who sowed them is the devil.The harvest is the end of the age, and the reapers are angels. Just as the weeds are gathered and burned with fire, so will it be at the end of the age. The Son of Man will send his angels, and they will gather out of his kingdom all causes of sin and all law-breakers, and throw them into the fiery furnace. In that place there will be weeping and gnashing of teeth. Then the righteous will shine like the sun in the kingdom of their Father. He who has ears, let him hear. Not all of Jesus' parables are explained to us, but fortunately, the ones that are most difficult to understand He explained to His disciples. Here we see Jesus making a comparison about the kingdom of heaven again, yet this time He speaks eschatologically. The wheat represents the sons of the kingdom, while the weeds represent the sons of the evil one. Jesus allows these two groups to grow together until the time of the harvest. This harvest represents the end of the age. God is the ultimate judge, and His justice is perfect. No sin goes unpunished. Eternal torment is the fitting consequence for rebellion against an eternal God. But if this is the case, who can escape God's wrath? Every weed will be plucked out of the ground, bundled up and tossed into that fiery furnace. What can be done to rescue such scoundrels like us? Fortunately, there is one who sows the good seed. Jesus takes a wretch like you and me and does something wonderful. He lived a perfect life for us. He died on the cross for our sins. He took upon himself the wrath of God in our stead. And three days later He rose from the grave defeating death. This is love that God showed for you and me. But what is more, Jesus passed onto us His righteousness. Yes, those who repent of their sins and trust in Jesus have His righteousness. They will shine in God's kingdom. This glory will not be brought about by anything they have done, but rather it comes from Jesus. His righteousness will be reflected off of those who look to him in faith. Take heed of Jesus' warning. Hell is a real place and real people are going to go there to suffer eternal punishment for their sins. Turn from your unbelief and trust in the only one who can save you from your predicament. Put your faith in Jesus. Only He can give to you the righteousness that you need.